Smile Dental Group is your premier partner in your child’s oral health journey. We offer a full range of pediatric dentistry services that are tailored to meet the needs of our young patients. We take the time to help them learn more about their oral health and how to make the best decisions to help foster a healthy, happy smile. Our compassionate, trusted dentists and staff work with your child every step of the way to ensure their dental needs are met. Patient education is a great way to help your child understand their dental health and the importance of visiting the dentist. We take a personalized approach to each patient, which helps them feel more comfortable when visiting our deal office. By establishing healthy oral health habits are a young age, can help prepare your child on how to nurture their smile as the age. Regular visits to the dentist help keep your child’s teeth and gums healthy. During a routine visit, our team can examine your child’s teeth and gums to check for any signs of gum disease, tooth decay, or other common dental concerns. When dental issues are addressed early, they reduce your child’s risk for future complication. Regular dental visits are especially important for growing smiles because it allows us to educate young children on the importance of healthy oral habits and address any issues that may lead common pediatric dentistry concerns like crooked teeth, cavities, thumb sucking, and teeth grinding. Early intervention is key to maintaining a healthy smile. 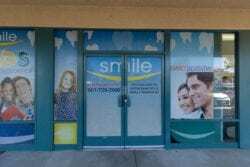 Smile Dental Group offers a full range of general dentistry service that is tailored to meet the needs of young patients. Our team will work with your child to build a treatment plan that is right for them. For children and teens who may be anxious or fearful about visiting the dentist, we offer a complete range of sedation dentistry options. We work with your child on an individual basis to asses their needs and determine the best solutions for their dental health and overall wellness. Most dentists recommend that a child should visit the dentist by the age of 1 or within 6 months of the emergence of their first baby tooth. We strive to make your child’s first visit a positive, fun, and informative experience. The initial visit may sometimes include a set of digital x-rays, a review of your child’s dental history, a full oral exam, professional teeth cleaning, and an assessment of your child’s dental health needs. During this visit, we will also work with your child to educate them on the importance of brushing, flossing, and maintaining an excellent oral hygiene routine. After the dental exam, we will make any recommendations for further treatment. Our team is comprised of highly trained and experienced dentists who are dedicated to helping your child achieve a healthier smile. Through advanced training and continued education, our dental care team is uniquely qualified to treat the dental needs of infants, children, and adolescents. 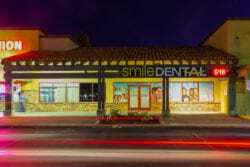 If you are searching for a family dentist in Antelope Valley, visit Smile Dental Group. To schedule an appointment, call one of our three offices in the Antelope Valley or request an appointment online. According to the American Academy of Pediatric Dentistry (AAPD), a child’s first dental care visit should be completed by the age of 1 or 6 months after the eruption of the first tooth. Neglecting the health of the baby teeth can result in infection, cavities, or tooth pain. Healthy baby teeth promote healthy permanent teeth. Healthy and intact baby teeth help with jaw development, comfortable chewing and speaking, and spacing for permanent teeth. What should I do if my child loses a permanent tooth? Gently attempt to reinsert the tooth into its socket. If you can not temporarily reattach the tooth, put the tooth in milk. Bring your child and the glass to our office. We will evaluate the condition of the tooth and make the most appropriate recommendation for your child’s needs. How to prepare your child for their first dental visit? Visiting the dentist for the first time can be frightening for some children. Educating them on the importance of dental care and creating a positive association with the dentist can be beneficial in the long run. During your child’s visit, you can rest assured that we will handle all aspects of their care with compassion, understanding, and positivity. We look forward to helping young patients achieve a healthier smile through personalized, high quality dental care.